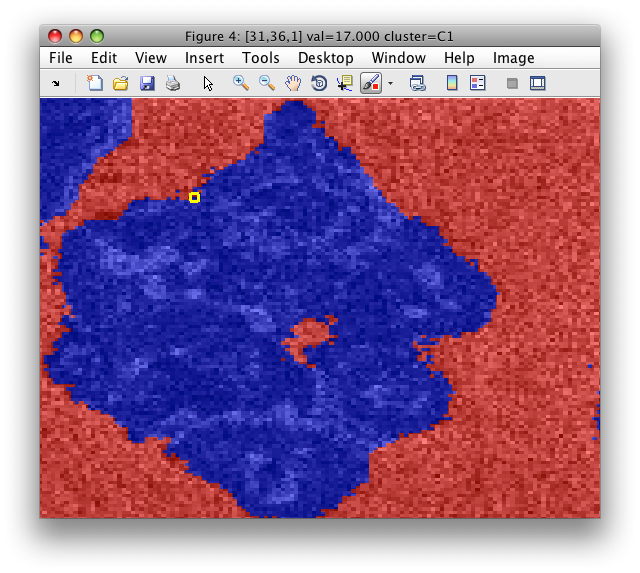 Region feature extractors process square image neighborhoods and represent its central pixel by the resulting feature vector. This is useful to account for local spatial information and structure in images. 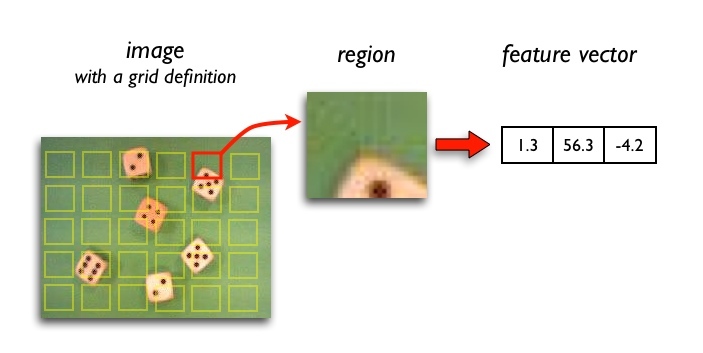 Typical applications are texture classification and image segmentation (distinguishing edges). It becomes a data set with three features corresponding to R,G,B bands respectively. 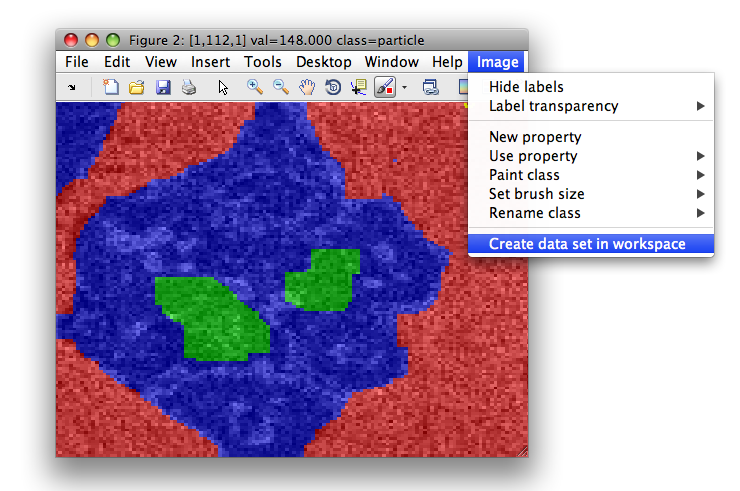 The blue color is the label layer that is uniform, because we have only one "unknown" class by default. Note, that the extracted image contains a thin border without data. This is because perClass computes region features only if the neighborhood fully covers image data. 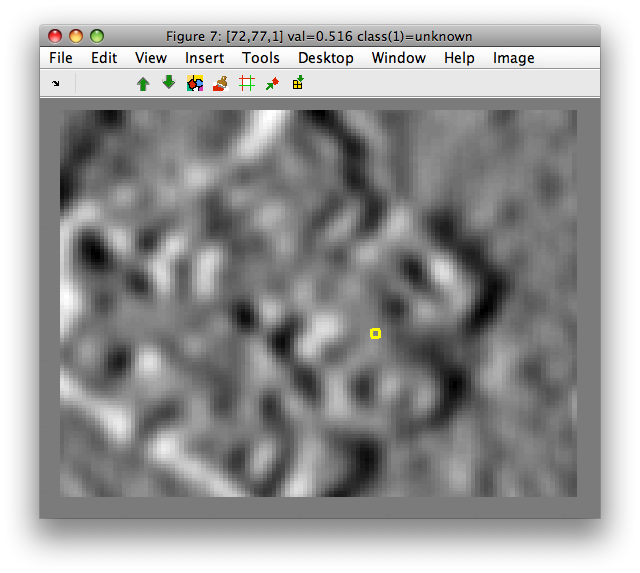 For example, the left-upper corner pixel cannot be represented because the neighborhood "sticks out" from available data. Therefore, the number of samples in A is slightly smaller that in the original image I. Why is local feature extraction useful? Let us try to separate objects and background by clustering. Move to the Figure 2 that contains data set A with both bands and select 'Cluster with k-means' from 'Image' menu. 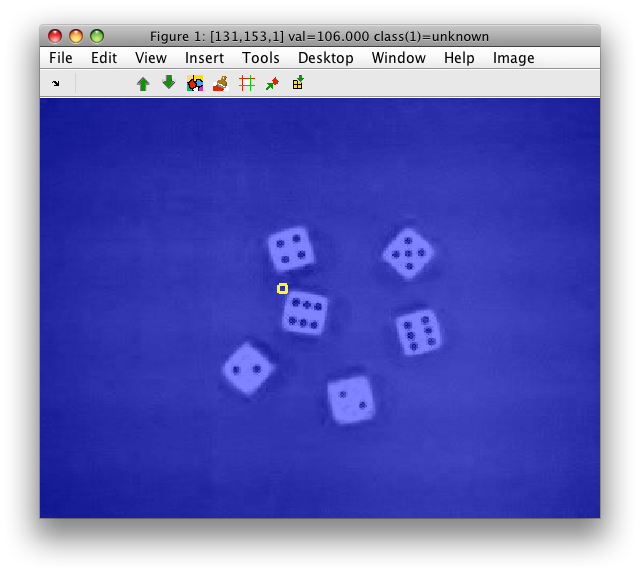 Enter the desired number of clusters, for us 2 and click OK.
We can observe is that clustering on mean/std features robustly identifies the dice objects including the dots due to larger spatial context. 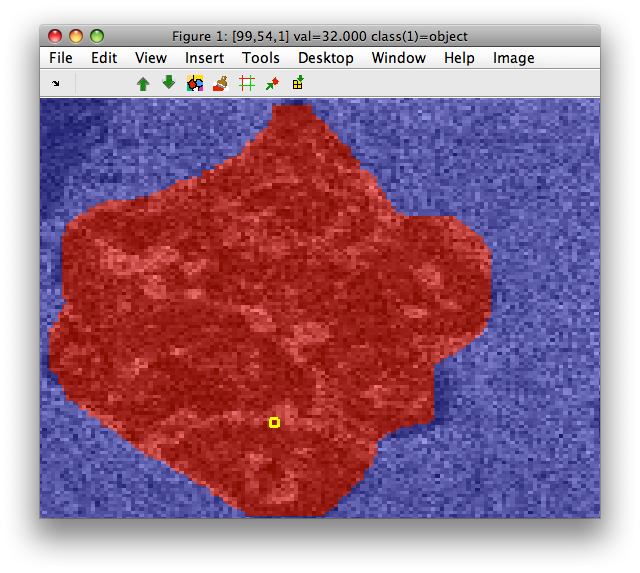 For comparison, perform clustering on the original RGB image I or its first band I(:,1). 'range',R : define data range with two-component vector R [min max]. Values outside the range are discarded. The histogram feature extractor requires explicitly specified data range. It is important that the 'range' is identical in the entire classification problem i.e. on the training set and in the production or test set. Therefore, you should not use data-driven definitions such as 'range',[+min(im) +max(im)]! This holds also for other histogram-like features ('histfeat' and 'cm'). Co-occurrence matrix is a two-dimensional histogram estimating probability that a pixel has a specific gray-level while a displaced pixel exhibits another gray-level. Co-occurrence matrix encodes structural information which is useful for derivation of informative data representation in texture classification problems. 'bins',N : number of co-occurrence bins (default: 8). Smaller values are more common as they yield less sparse matrices. 'displ',D : pixel displacement in vertical direction (default: 1). Number of pixels at which we record the gray-level relations. 'der',D : derivative (default: D=0). D may be scalar or vector with two components with different derivative for rows and columns, resp. 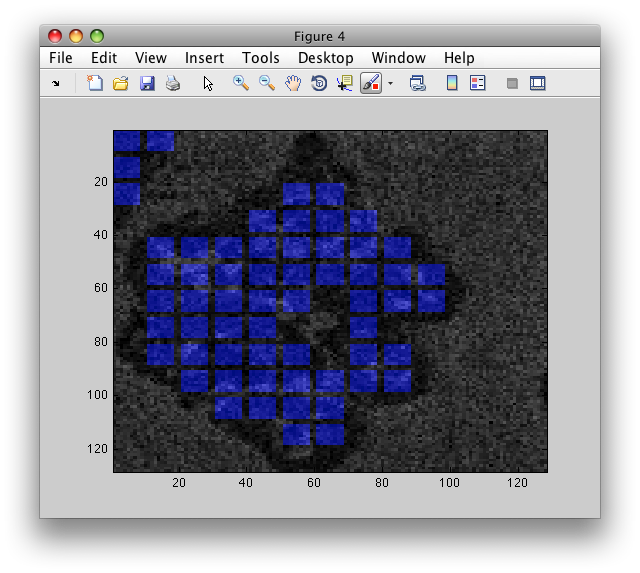 The 'gauss' feature extractor convolves input image with Gaussian filter or its derivative and returns its response in the central pixel of each image region. Note the message displaying the actual coverage of the convolution kernel on the image region. Gaussian kernel has in general an infinite support. In practice, we only use the convolution values in the neighborhood defined by the 'block' option. Therefore our filter only covers the sliding window partially. Sobel filter computes local image gradient in 3x3 image neighborhoods. Filter bank is specified with 3D matrix K (block x block x filter_count). The 'fbank' extractor supports maximum response filtering with 'join' option. To define it, a vector F should be supplied with one entry per filter. Each entry in F specifies to which final output (joined filter) is this filter merged. The figure shows original image and one output feature i.e. combined output of multiple orientation filters. Gray-level morpology enables straightforward edge detection in single-band images. It uses a square structure element with a size defined by the 'block' option. At the low level, erosion and dilation operations are defined similar to the classical black and white morphology. On top of these, opening and closing operations are specified. The high-level 'edge' extractor uses opening and closing to enhance edge regions. 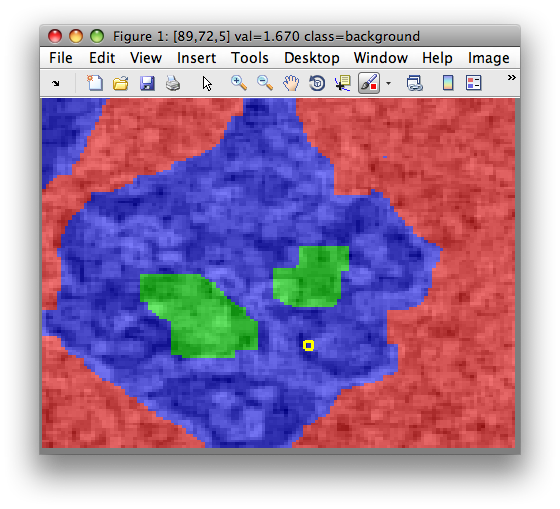 Apart from built-in feature extractors, sdextract can execute a custom Matlab function on each image neighborhood. This allows us to quickly experiment with arbitrary external code for feature computation while benefiting from the flexible image grid definition and masking. To use custom feature extractor, we need to create a Matlab function following a specific syntax. As an example, lets define a function custom_extract_hist.m that will compute a local image histogram in each region. In our example, we want to be able to set the number of histogram bins, and data range for the histograms estimated. These are the extractor parameters. How to implement the custom feature extractor function? The first part is called by sdextract once, before the block-by-block feature computation, to initialize any parameters our extractor need and return the feature labels. The data input argument is empty, the par argument is a structure with some basic fields describing the extraction process, such as block size and step. We may add any further fields to par. In our example, we set the bins, min, and max fields to default values, in not already present. We also create anything we need for feature extraction process. In our example, it is useful to define the histogram binning vector histbins once. Finally, we return the feature labels. The second part of the extractor function is called for each image neighborhood. The data argument is now a neighborhood matrix and par our parameter structure with all fields we set. Now we perform the computation and return the feature vector. Note, that feature extraction process is not limited to single-band images. If the input image data set, passed to sdextract has multiple bands, the custom function will receive a 3D matrix for each neighborhood. In this way, you may implement e.g. color texture features or process hyperspectral images in one pass. Block size is an scalar defining the square sliding window. 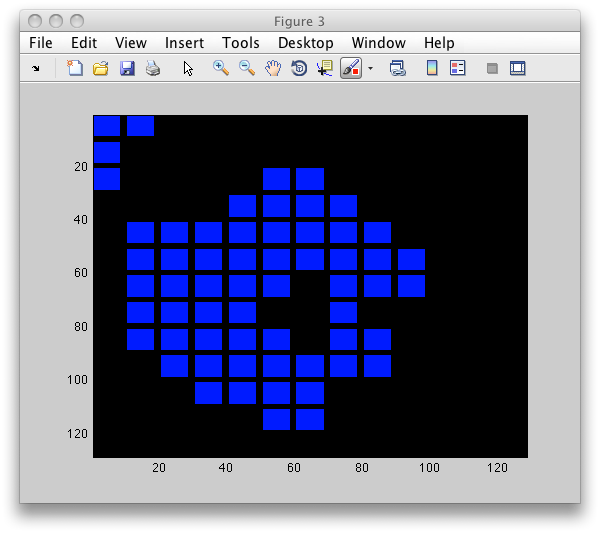 Default value is 8 (8x8 pixel regions). It may be changed using the 'block' option. The default step is 1. Large step is useful for representing large images as it yields sparse smaller representation. 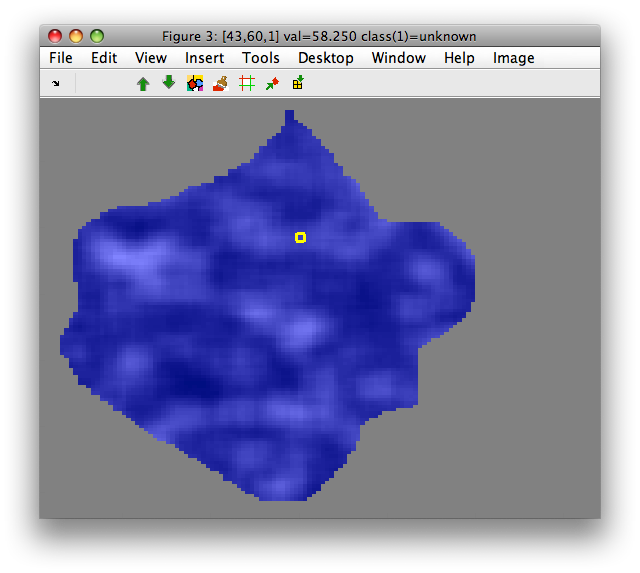 The getiminfo method can be used to access detailed information on grid definition for any image data set. 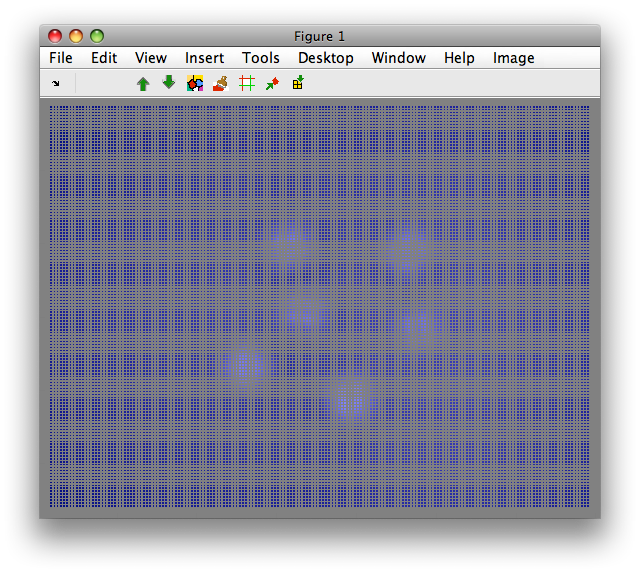 A new figure window opens with out image constrained to grid. Often, we only want to process certain part of an image, e.g. object that was already segmented out from the conveyor belt by low-level image processing. sdextract accepts the 'mask' option that specifies where to compute the features. We may extract features only from the region defined by this mask. The 'mask' option takes, as argument a logical vector or image matrix. Features are computed only for neighborhoods that fully cover available image data. Therefore, the resulting data set out contains less samples than the 'object' class in M.
When applied to sddata data set with image data, sdextract propagates image labels and all sample properties to the output data. >> Creating data set data2 in the workspace. When extracting features from local image neighborhoods, we often want to visualize the exact block position in the original image. For example, this is very useful in order to understand, what parts of the object are misclassified. The label image shows the image neighborhoods in the context of the original image, used for feature extraction. Note the gap inside the particle. As mentioned above, sdextract computes features only in regions without holes. We may wish to visualize the label image blended with the original image with 'blend' option. We provide image matrix with <0,1> values with the same dimensions as the original image (imsize in getiminfo(b)).